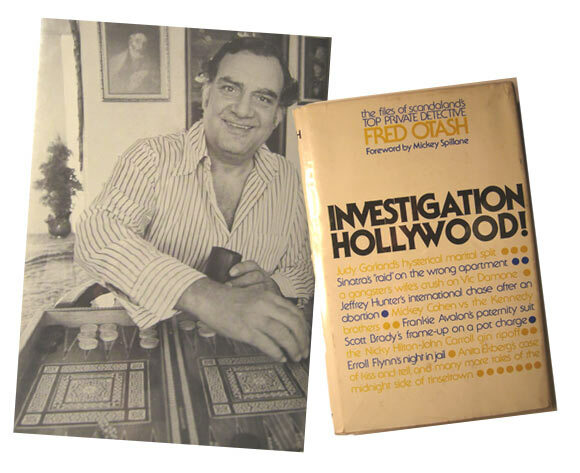 Fred Otash is an extremely controversial figure in both Golden Age of Hollywood history as well as Marilyn Monroe history. 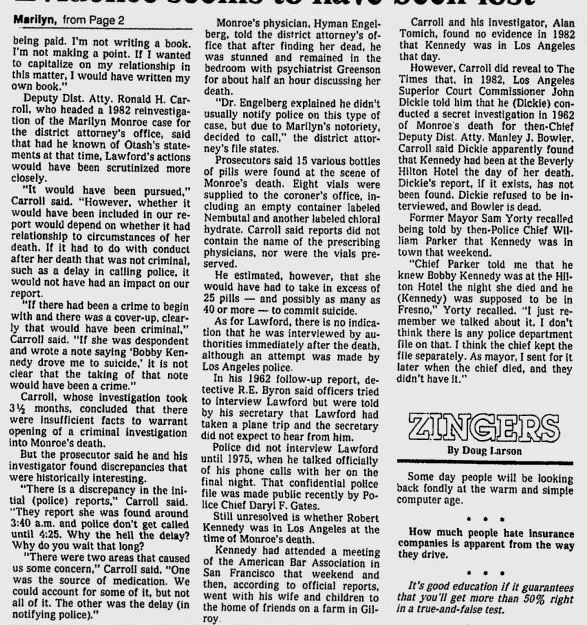 He made some outlandish claims in 1985 saying that he had tapes that proved Marilyn was killed by Bobby Kennedy. He claimed to be involved in the Wrong Door Raid but the actual private detective that Joe Dimaggio hired was named Barney Ruditsky. Otash was a former cop who left (some say disgracefully) in 1955 after having a falling out with his police chief, William H. Parker. Most sources agree that their falling out was because Otash was releasing confidential information to scandal rags. He ended up being involved in a libel case against Confidential in 1957. He was interviewed by Mike Wallace on 8/25/1957. You can read the transcript here. 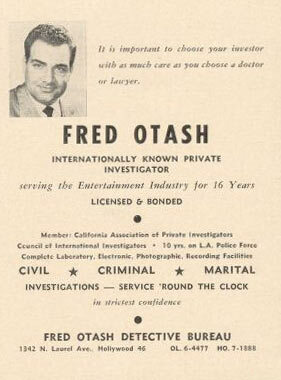 In it Otash talks about a flyer that lists multiple private investigators, adjusters, collection agencies, etcetera. 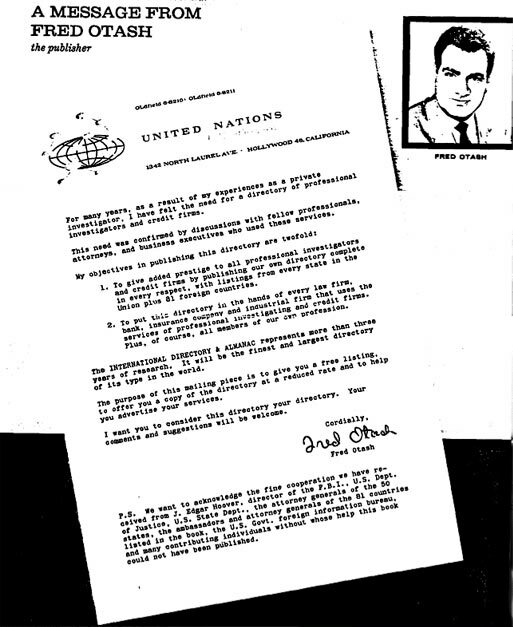 He implied that he was endorsed by both the FBI and the United Nations. Neither agency had endorsed him and his California Department of Professional and Vocational Standards was revoked in 1965. Otash released a book in 1974. This book was ghost written by Raymond Strait, Jayne Mansfield’s press agent, who will go on to write slanderous books about many different people in Hollywood including co-authoring Eric Root’s book on Lana Turner. There is NOTHING about Marilyn in this book, let alone his later claims. 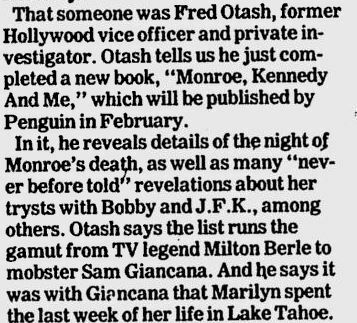 In 1985 Otash first came out with his claims that he had wired Marilyn’s home, had heard her killed, etc. 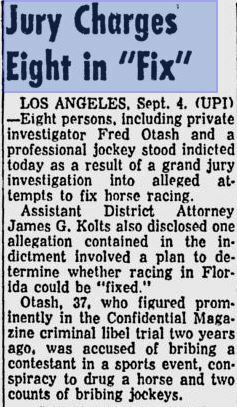 These tapes have never been released although Otash’s daughter claims they exist as well as Ray Strait claiming he had heard them. The biggest thing you can see is that Otash’s story has changed considerably over the years. Only after many people had come out of the woodwork did Otash come out and say that he had bugged her apartment (Anthony Summer’s “Goddess”) as well as her home on 12305 5th Helena Drive. There has never been any bugging equipment found at the apartment on Doheny Drive. Veronica Hamel claimed that 5th Helena Drive was wired and bugged and that she spent $100,00 to get the wiring removed. The main issue with her claim is that there is no proof that she actually owned the home. Records support the Nunez family (who bought the home in 1963) still owning it until 1980. There are also no reports from when she supposedly found the bugs in 1972. Hamel apparently first made the claim in the 1980’s. Otash’s story has changed a few times over the years. First he was hired by Bernard Spindel who worked for Jimmy Hoffa who wanted evidence against the Kennedys. There is only one account of Bobby ever going to Marilyn’s home so it is unlikely that her house would be bugged. 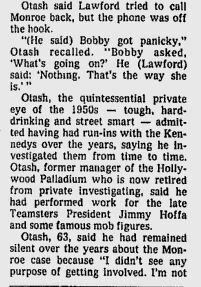 Otash further claims that in mid July of 1962 Marilyn asked him to bug her phone. 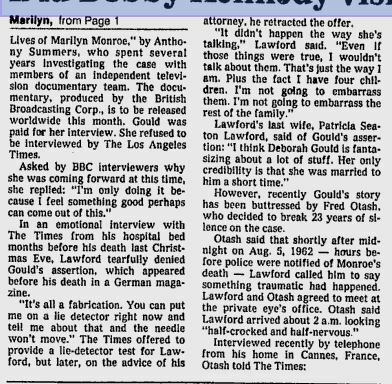 With how private Marilyn was, it is unlikely that she would want someone like Otash (an informant for Confidential Magazine) to listen to her private conversations. Donald Wolfe states in his book that Spindel wasn’t hired by Hoffa but actually by James Jesus Angleton and the CIA. He gives no clear reason why he believes this. Wolfe then goes on to say that the tapes were seized by NY-DA Frank Hogan in 1966. According to the DA, ALL files from Spindel were destroyed. How convenient. 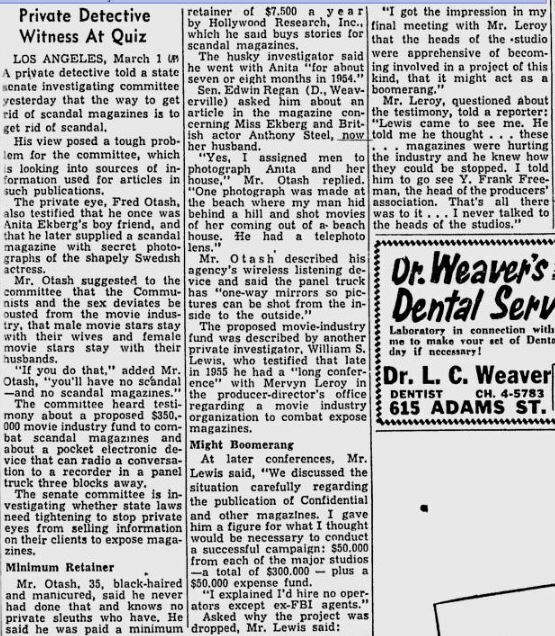 In 1992 Otash then turns his story around and makes the outlandish claim that he was hired by Howard Hughes who wanted to get the dirt on the Kennedys for Richard Nixon. 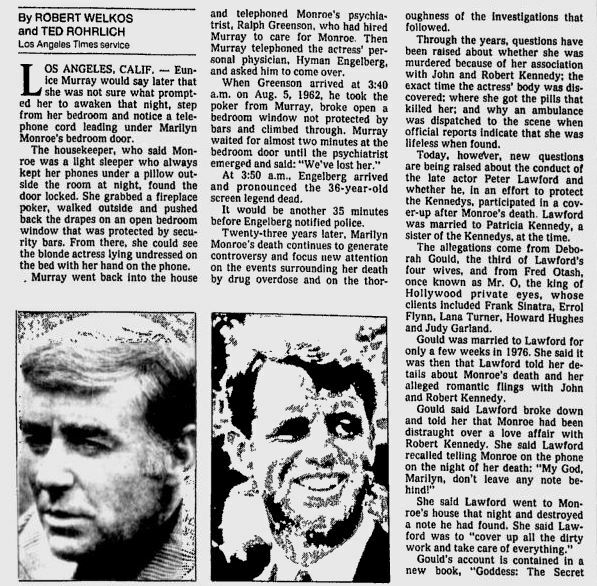 Otash’s claims heavily rely on the idea that Marilyn was sleeping with both Kennedy brothers. There is nothing to support these claims and transcripts of his tapes continue to be kept away from the public (Otash claims they were seized and destroyed in 1966). 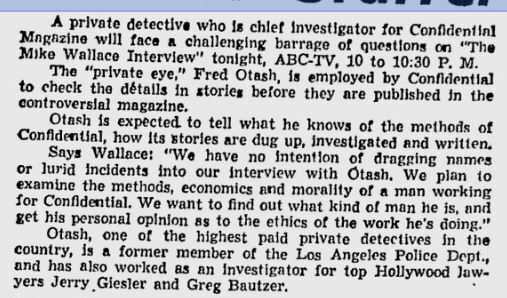 Fred Otash’s daughter Colleen continues to refuse to allow the public to view her father’s files or transcripts which is proof enough for me that she has her own doubts about their validity.